Product Details - Material- Non abrasive material for the most persistent of the chewers, Use - Gently massages the gums and keeps tartar away, Non toxis and durable, Dimensions -9 cm. 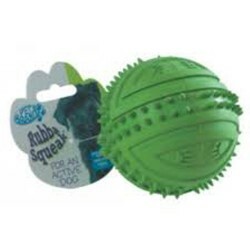 Product Information - Tough Rubber dog toy with a varied and interesting raised texture.Thoughtfully designed to be used as a retrieval toy or to help satisfy a dogs urge to chew in a non-destructive way.Perfect for puppies and small, medium and large dog. breeds.Availalbe in an assorted set of 6 vibrant colours and shapes. Contains a hidden long winded squeak.